CHATTANOOGA, Tenn.--(BUSINESS WIRE)--A 10-year review of disability claims shows the effects of an aging workforce, medical advances and the power of early intervention, according to data from Unum (NYSE: UNM), a leading provider of disability benefits. 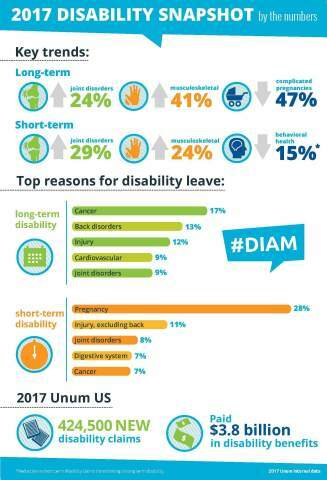 Unum tracks reasons behind workplace absence in its disability data and shares results each May during Disability Insurance Awareness Month. Short and long term disability claims for joint disorders and musculoskeletal issues have increased significantly. Cancer has stayed the No. 1 reason for long term disability claims, representing 17 percent of claims. Pregnancy continues to top the list of short term disability claims, at 28 percent. Long term disability claims for complicated pregnancies have decreased 47 percent. The percentage of Unum’s short term disability behavioral health claims that transition to long term is down 15 percent, the result of a dedicated behavioral health program implemented at Unum. In addition, higher obesity rates and stress among workers can cause or aggravate other health conditions, like heart disease and musculoskeletal issues, Breter said. There’s good news, too, though. Advances in medical treatment, lower C-section rates and more resources for new moms are leading to fewer complicated pregnancies. And, Unum’s dedicated early intervention and preventative strategies for behavioral health claims mean more people are able to get to back work sooner. A lengthy and unexpected absence from work can have serious financial consequences as well. One in four U.S. workers has less than $1,000 in savings, and more than half of households would struggle to recover from an unexpected $2,000 expense, according to a 2017 GoBankingRates study. Unum Group is a leading provider of financial protection benefits in the United States and the United Kingdom. Its primary businesses are Unum US, Colonial Life, and Unum UK. Unum’s portfolio includes disability, life, accident and critical illness, dental and vision coverage, which help protect millions of working people and their families in the event of an illness or injury. Unum also provides stop-loss coverage to help self-insured employers protect against unanticipated medical costs. The company reported revenues of $11.3 billion in 2017, and provided $7 billion in benefits.